* A guideline for light source replacement. The maintenance-free period may be shortened due to environmental conditions. 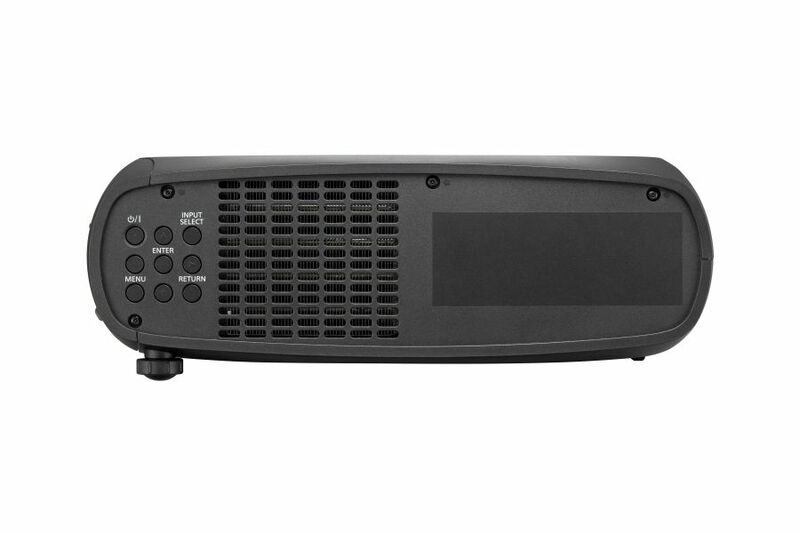 The PT RZ470 features 3,500 lumens of brightness. The rate of brightness deterioration in the LED/Laser-combined light source is extremely slow compared to lamp-based projectors. The SOLID SHINE drive uses a built-in sensor to constantly detect the light intensity of the light source and correct corresponding changes in white balance. This all helps to maintain excellent picture quality for a long period of time. Contrast is outstanding too, at 20,000:1, and images are reproduced with a wide dynamic range. 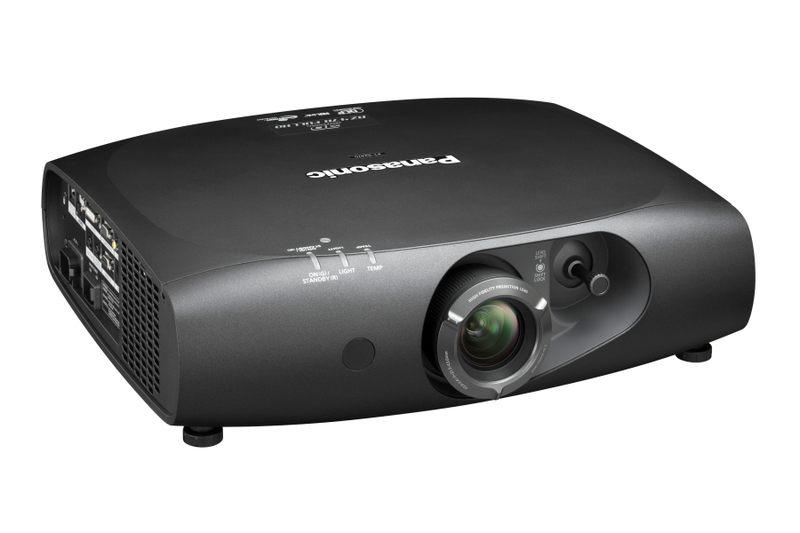 The PT-RZ470 also features a HD (1280x 800) DLP™ chip, allowing highly detailed HD images without resizing. The Multi-Screen Support System optimally adjusts multiple screens: Edge blending, color matching. Edge Blending - The edges of adjacent screens can be blended and their luminance controlled. * Edge blending function cannot be selected when the VIDEO input is selected, and the edge blending setting is disabled when viewing 3D images. This function automatically corrects the brightness fluctuations that occur over time in the individual projectors of a multi-screen system. 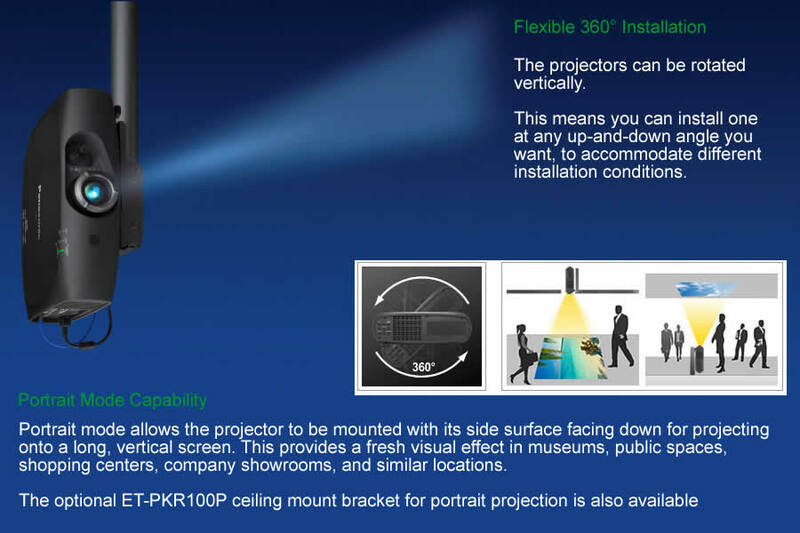 Up to eight projectors can be controlled by connecting to each other via a hub, and this can be increased to a maximum of 2,048 projectors by using "Multi Projector Monitoring and Control Software". The PT RZ470 can deliver impressive 3D images when viewed with active glasses. You can build a 3D system without the need for the optional transmitter. 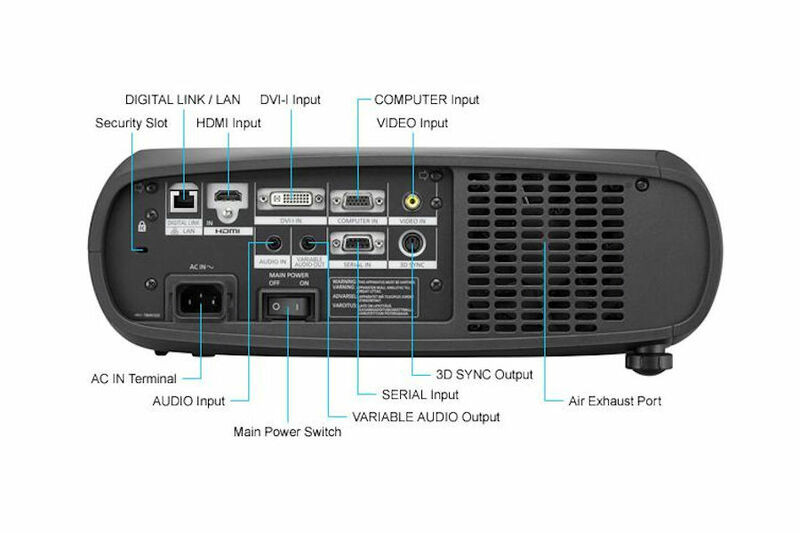 A 3D system can be configured by connecting an additional 3D IR transmitter to the projector's 3D SYNC OUT terminal. The image appears almost instantly upon powering up the rz470, and there is no need for cooling after turning the power off. The power can be turned on immediately after being turned off, and it can be turned on/off as many times as you want. Laser cooling is performed by releasing the heat to cooling fins, then cooling with a heat pipe cooling system. This suppresses temperature rises inside the projector and allows stable operation up to an ambient temperature of 45 °C (113 °F). The use of this heat-pipe cooling system also achieves quiet operation of 29 dB, enabling viewers to concentrate on the presentation or on quiet movie scenes. The area between the LED/Laser to the DLP™ chip and prism is hermetically sealed to form an airtight structure for the optical block, the heart of the PT-RZ470 projector. This resists the effects of dust and other particles in the air and enables use of the projector in a wide range of environments. Optimal color reproduction can be achieved by selecting this mode, compliant with ITU-R Recommendation BT.709, when images from an HDTV source are projected. The wide shift range accommodates various room sizes and shapes. Equipped with a DIGITAL LINK terminal, the PTRZ470 allows transmission of HDMI, uncompressed HD digital video, audio and control signals (Ethernet, RS-232C) for up to 100 meters (328 feet) through a single CAT5e (STP) cable or higher. This simplifies cabling and system upgrades, making it ideal for ceiling-mounted and other permanent installations. Web browser on a computer connected through a wired LAN system lets you remotely operate projectors and check their status. 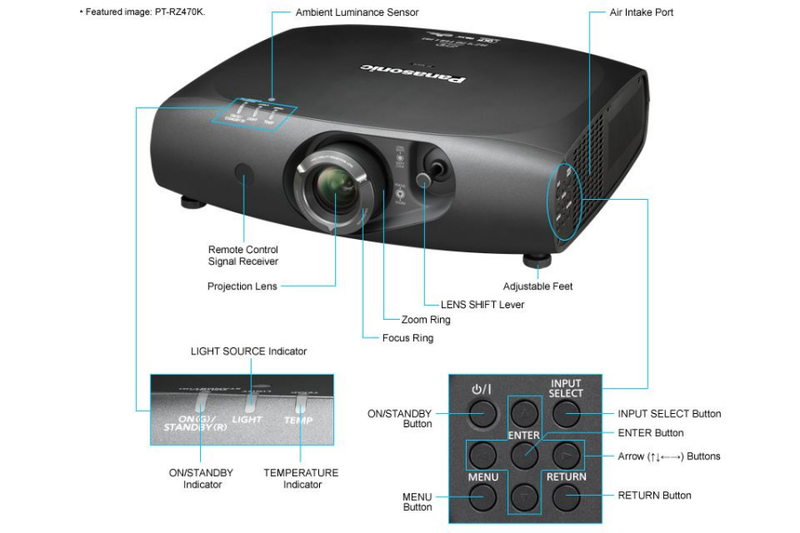 An e-mail messaging function can also notify you the overall projector status. Lamps can blow, if you need your projector working and can't afford down time, you may need to keep a spare lamp. 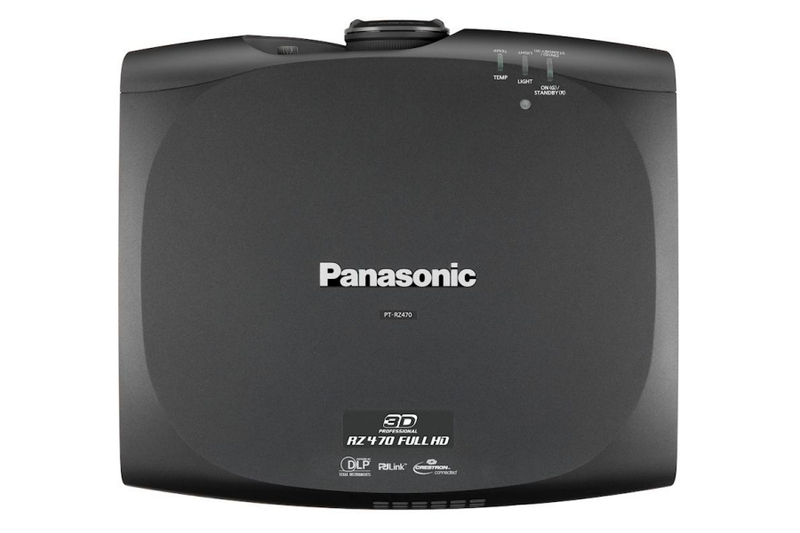 The replacement projector lamp for the Panasonic PT-RZ470eak is the No Replacement.